No crates, cages or crowding. Animal centered, all physical alterations prohibited, 5+ Entire life on the same farm. No hormones or antibiotic enhancements. Antibiotics are needed in crowded environments where they can easily become ill due to the conditions. Hormones are given to bulk the animal up much quicker. Raw Pork Breakfast Sausage–made in house. Pork, brown sugar, sea salt, red pepper, black pepper, parsley, sage, canola oil, lamb casing. The best way to cook breakfast sausage is on the stovetop in a pan large enough to accommodate without crowding. You’ll want to cook it slow, over low heat with enough water to cover the bottom of the pan. Cover with a lid and let it steam for about 4-5 minutes. Remove the lid and allow the water to evaporate, still over low heat. 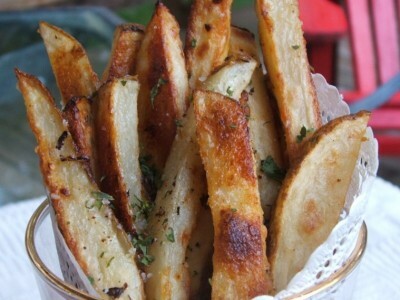 Once you start to hear them sizzle, watch them closely, give them one turn when golden brown. Pork, raw sugar, malted barley, sea salt, yeast, extract, spices. No nitrates added except for those naturally occurring in ingredients such as celery, juice powder, parsley, cherry powder, beet powder, spinach, sea salt. Bacon especially goes a long way in terms of flavor, especially THIS bacon! I don’t think I have ever tasted a more delicious piece of bacon. The bacon is coated with a dry rub which caramelizes when you cook it. 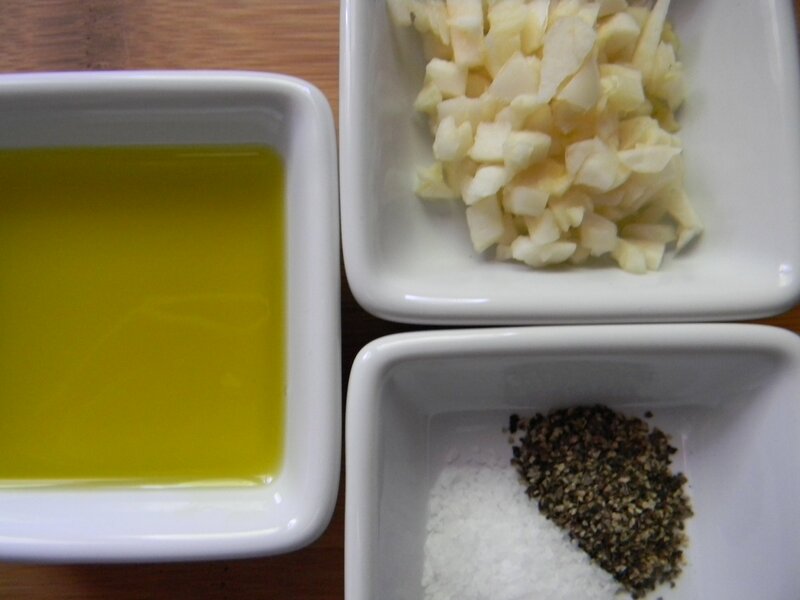 Great to crisp up and cut into small pieces as a condiment for salads or great to throw into scrambled eggs so you have great flavor without going overboard with portion size. Try when making my pan roasted brussel sprouts. Serving a crowd? Cut the pieces in half before cooking as they are long, thick slices. 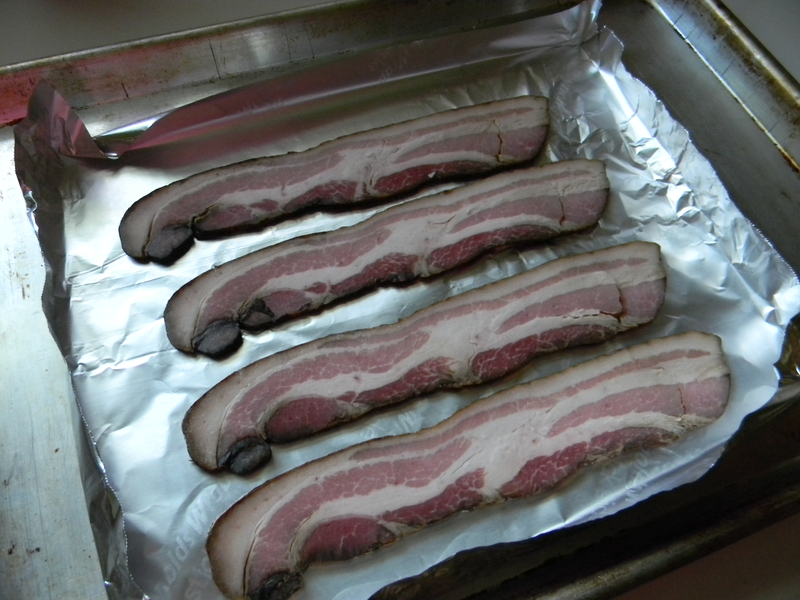 The best way to cook bacon is in the oven, you get beautifully cooked flat pieces. Spread over a non-stick foil lined baking sheet with sides without crowding. You can see here that I didn’t have enough bacon to fill the pan so I curled the edges of the foil up to prevent excess spattering in the oven. Easy clean up, let it cool and fold it up and toss, or you could wipe it clean with a paper towel and recycle it. A full sheet of bacon should take approximately 15-20 minutes. My four pieces of bacon took about 16 minutes. You may wonder about the cost. Consider the importance to consume breakfast meats in moderation. Even though they are nitrate free, this is still what I would consider a treat. Two pieces of bacon or two pieces of sausage per serving. That being said, you can ask the butcher to package exactly what is needed for your crowd. When you buy the 1 lb. packages there are far more servings than needed. Quality versus Quantity. The bacon was $9.99/lb. I bought 4 slices, it came out to $2.80 or $.70/slice. 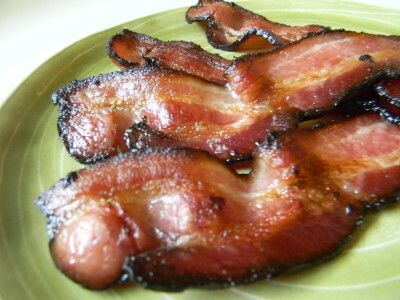 Oscar Mayer bacon is typically around $7/lb. and the slices are super thin and sometimes tricky to pull apart. The sausage was $6.99/lb. and I bought 12 pieces, which came out to exactly $6.99. 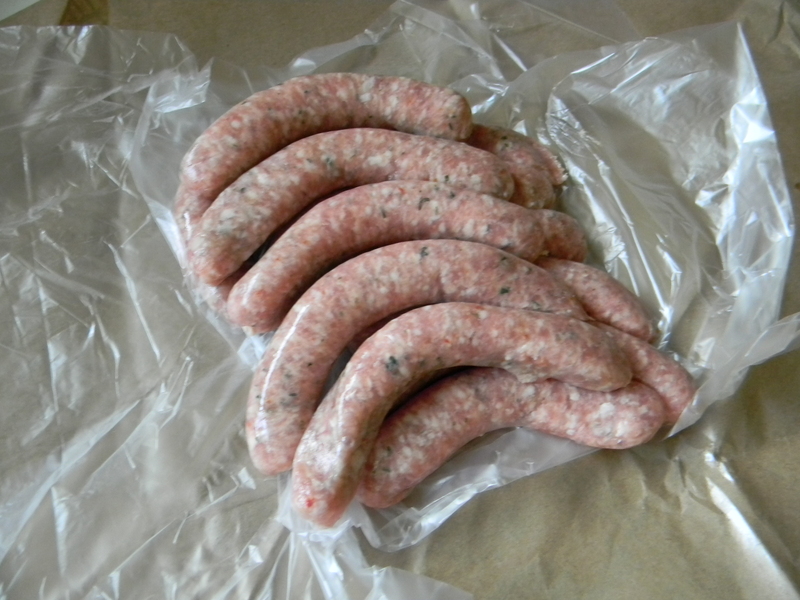 The links are larger than say a Bob Evan’s sausage link, which I think are about one ounce links. Thanks for reading, have a great, healthy day! 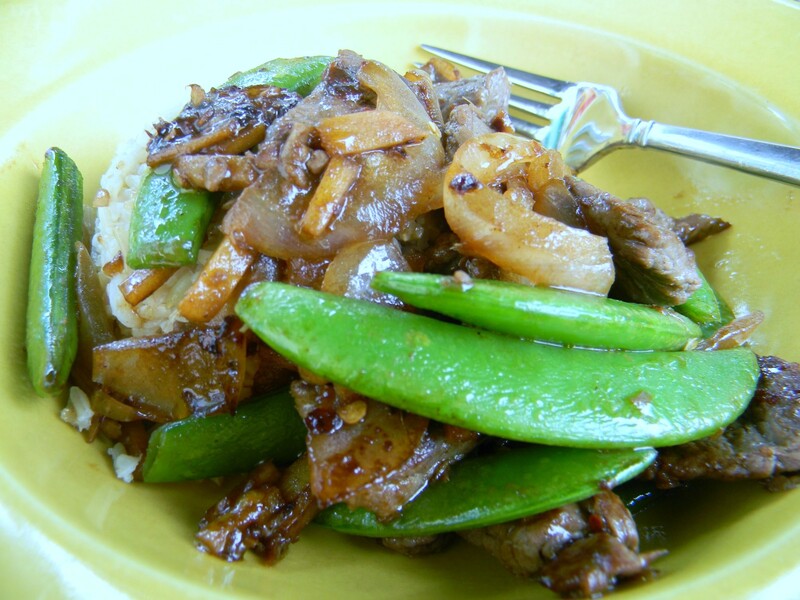 Simplest Ginger Beef Stir Fry…..
Light soy sauce and hot chili oil are the stars of this dish. 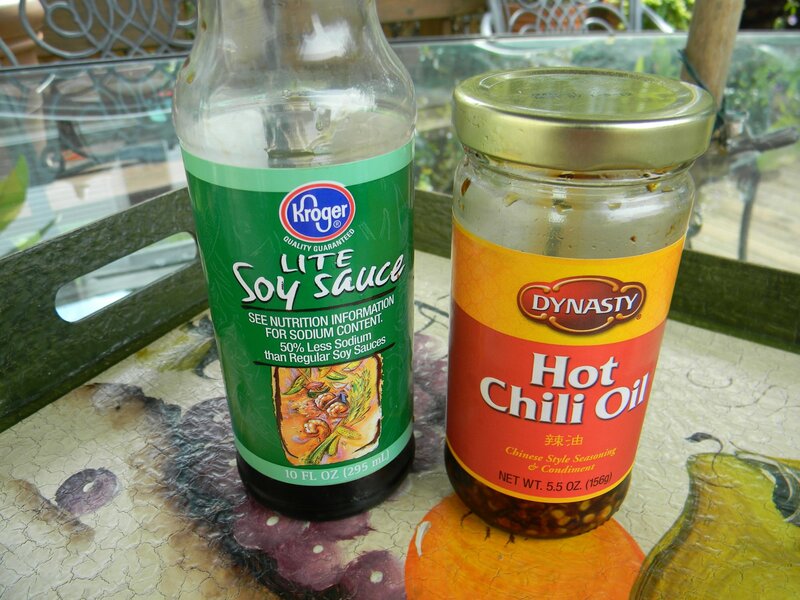 The hot chili oil has a delicious garlic flavor as well as some heat. Of course, there’s ginger and garlic which are essentials in a good stir fry. Have all ingredients ready to go before heating the pan. Have the rice going as well. 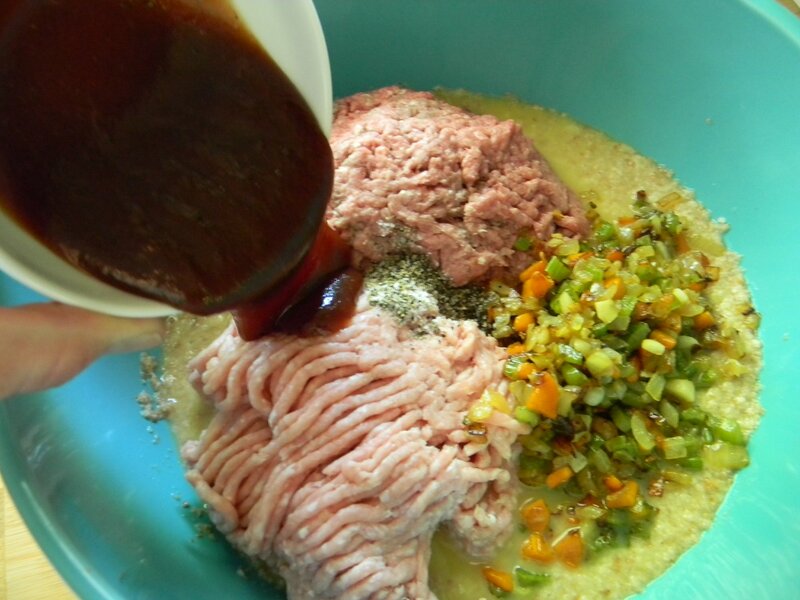 1) Trim and slice the beef and place into a small mixing bowl. Sprinkle the cornstarch over the beef. Mix well with your hands to coat. Add the rest of the marinade ingredients and mix well. Allow to marinate in the refrigerator for at least 30 minutes. 2) Prepare the peas, onion and ginger. 3) Heat a large skillet over high heat. 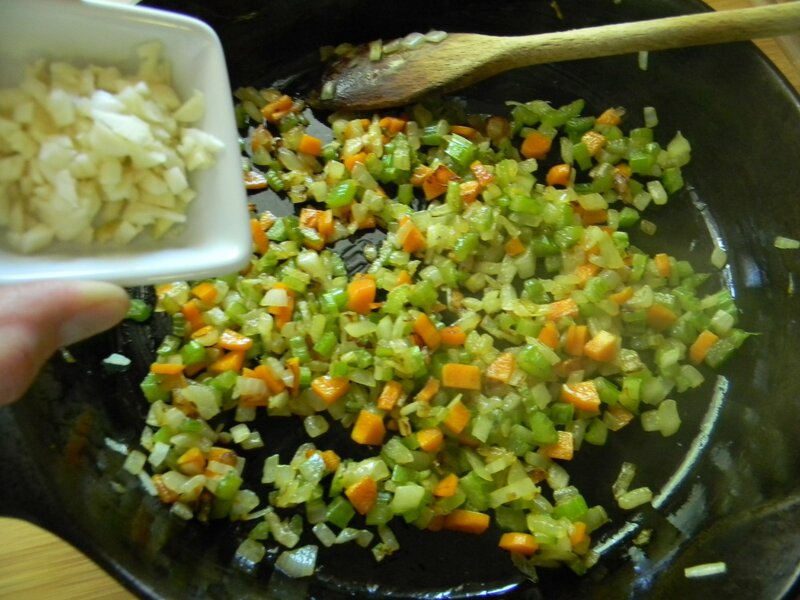 Once the pan is very hot, add the 1 1/2 tablespoons of canola/vegetable oil. Add the ginger and onions. Stir fry until the onions/ginger get nicely brown. Remove them from the pan and put into a small bowl. Add the beef, being sure not to crowd in the pan. Try not to stir until you’re sure the beef is brown. Add the onions back to the pan, the pea pods, soy sauce and chili oil. Cook another 2 minutes or until the peas are bright green. Serve over steamed rice. So good! *Longest cooking veggies to lowest. Add them to the pan in this order. **White steamed rice tip. Rinse the rice thoroughly in a mesh colander under cool water. 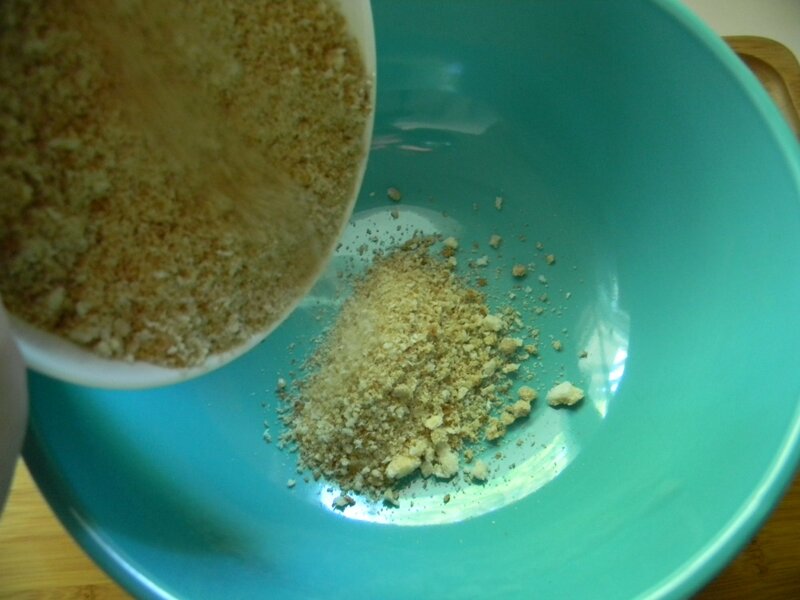 This will remove much of the starch that can make rice gummy. Add water to the pan 2 parts water to 1 part rice, bring to a boil, reduce heat to medium and allow the lid to be slightly ajar. Cook for 17 minutes. We had grilled pork chops tonight and everyone cleaned their plates! 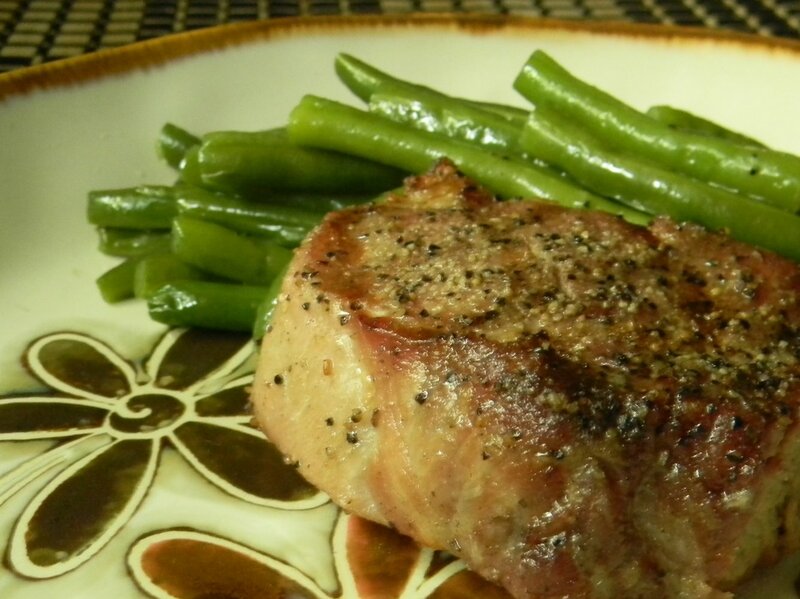 I thought I’d share a few tips on grilling pork chops. 1) First and foremost, buy a whole boneless pork loin. Watch the sale papers as whole pork loin often goes on sale. Buy a couple and freeze one for later, they thaw beautifully. I usually figure 6-8 ounces per serving. Remove the loin from the store packaging and wrap with cling wrap. Wrap with heavy duty foil, label and date. When you want to thaw it out, you can do so in the refrigerator for a couple of days or I put the wrapped loin in a zip bag and let it sit in a large bowl of water. Place the bowl in the refrigerator to keep it safe. It will take several hours but will be much quicker than thawing in the refrigerator. Give it a turn after a couple of hours. 2) With a very sharp knife, cut the loin into equally sized chops to your desired thickness. I like 1 1/2″ chops. 3) Season however you wish. Tonight I used Penzey’s Chicago Steak Seasoning but you could season very simply with kosher salt and fresh ground black pepper and a little granulated garlic. 4) Allow the seasoned chops to sit at room temperature for 30 minutes before grilling. 5) Preheat the grill. Lower the heat to medium-low. 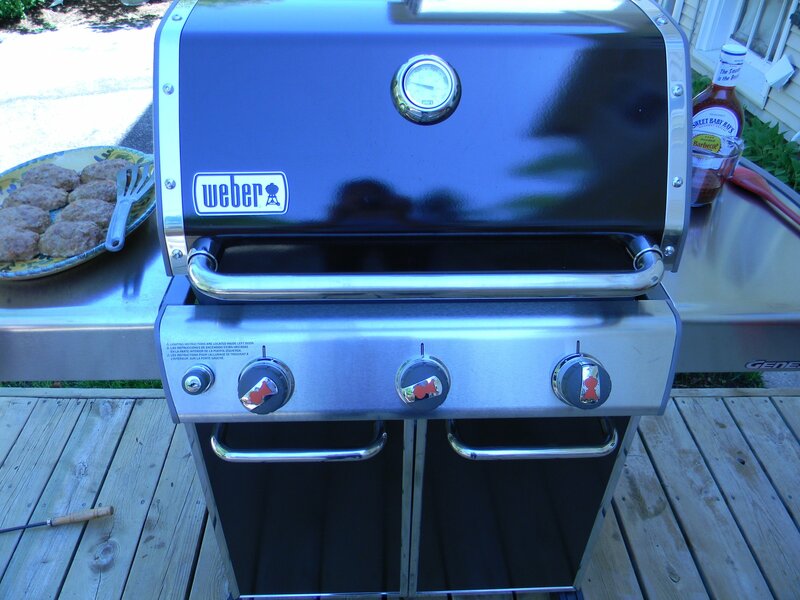 Place the room temperature chops on the grill and close the lid. Resist moving them around, allow them to sit. For a 1 1/2″ thick chop, cook on medium low for 5 minutes then give a quarter turn for nice grill marks. Close lid and cook another 5 minutes. You should be able to see that the meat is cooking up from the bottom and it’s becoming opaque. Flip the chops and cook another 5-8 minutes. An instant read thermometer should read 140′. Allow the meat to sit covered with foil for 10 minutes before serving. Spoon those lovely juices that accumulate on the plate over the chops when serving. Cooking lean pork over high heat will dry them out quickly. Also, know that it’s ok for the center of the pork to be slightly pink. Some restaurants even serve it medium, not my personal preference. There you have it. Moist, juicy, tender, inexpensive and most of all, delicious and perfectly grilled pork chops. 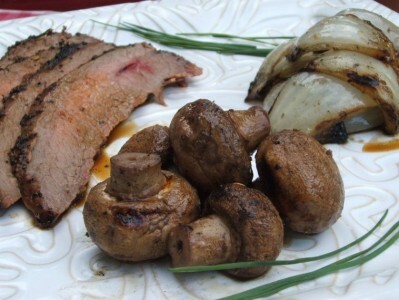 Serve with grilled onions and mushrooms, a simple baked potato and steamed green beans. Simple perfect dinner. Everyone will be making corned beef tomorrow. I made it this week for my clients. I made it the traditional way and the way the package suggests which is to cover with water, add the enclosed seasoning packet and simmering for 2 1/2-3 hours. Tomorrow we’re having Joe’s family over and I’m making traditional St. Patty’s Day fare. I’m going to try something a little different with the corned beef. I usually trim off as much fat as possible before cooking. This time I’m going to save the trimming until after the beef is cooked tender. I’m going to put it into a large roasting pan (that has a lid) with the seasoning packet and just cover it with water. In other words, a lesser amount of water. Instead of simmering on the stove top I’m going to oven braise at 325′ for 3 1/2 hours. I think the combination of the very heavy roasting pan and consistent moist heat will make an amazing corned beef…we’ll see. Once the meat is tender, I’ll remove it and add the halved red potatoes and back into the oven for 30 minutes or so. I do not boil the cabbage as I think it has little flavor. I much prefer sauteed cabbage. It has much more flavor and is quite delicious. I make it often throughout the year. I will also make Margie’s Irish Soda Bread and homemade horseradish (scroll down to the next post). Be sure to use lots of raisins in the soda bread as the recipe suggests. The bread is so, so delicious! Of course, I’ll make some sort of sweet ending. I’m thinking assorted cookies as the corned beef dinner is so heavy. Have you seen the strawberries?? They’re in season and so beautiful at this time. If I can find some on sale tomorrow it may change what I’ll be doing for dessert…maybe strawberry shortcake? I always change my mind, even at the very last minute! Yup. 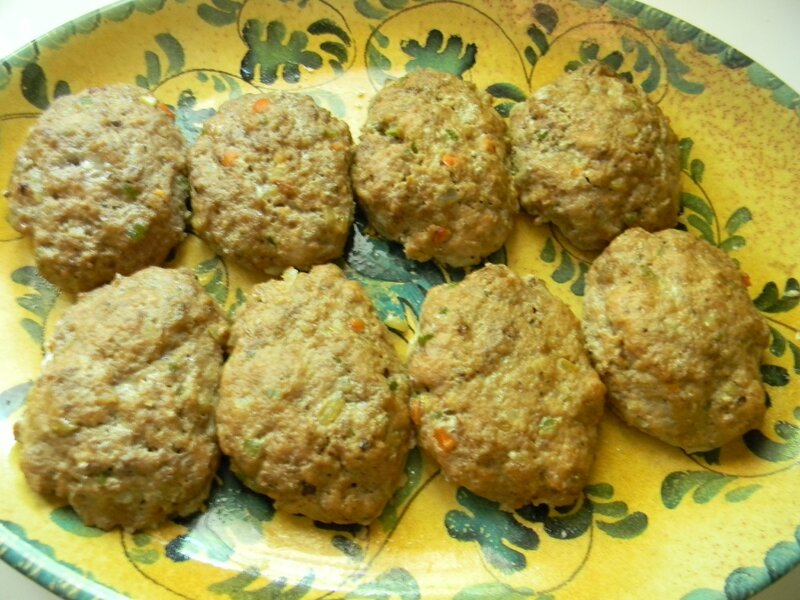 You guessed it, ground turkey and chicken meatloaves. 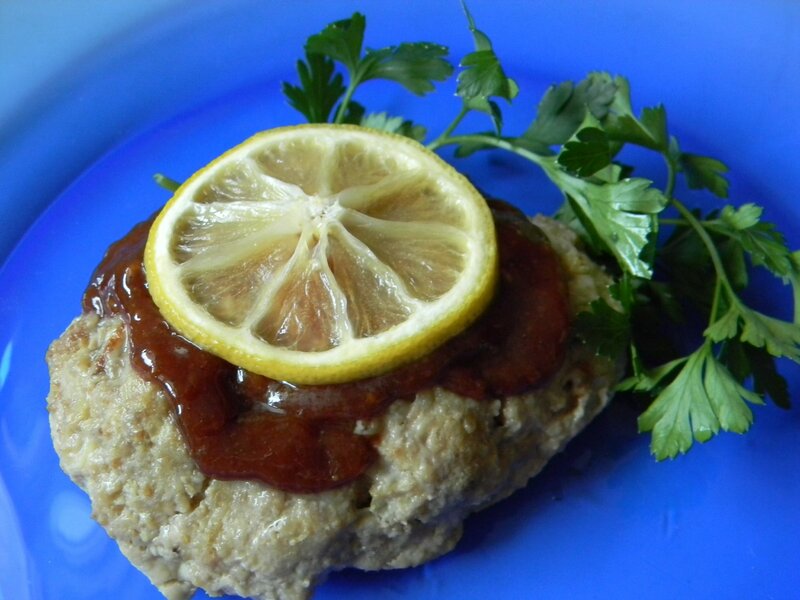 Here’s how I came up with this meatloaf. I was watching Food Network and Rachel Ray was making turchicken burgers. I then used my good friend Lori’s meatloaf recipe and used this combination of meat instead of ground beef. I find boneless skinless chicken thighs really flavorful. I bought the boneless, skinless thighs and trimmed them of excess fat. 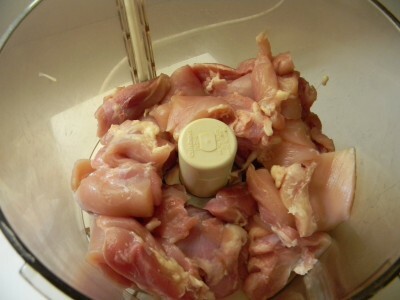 I cut them into chunks and put them into my food processor to finely chop the meat. Worked out perfectly. 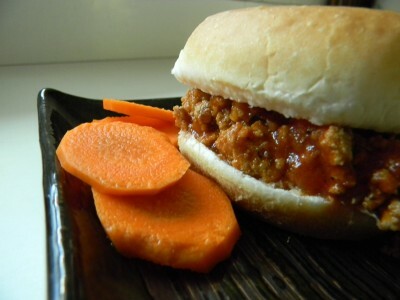 You can skip this step, of course, and buy ground chicken. As far as my friend Lori’s recipe, it’s awesome! I think the ingredient list is quite unique and I love the lemon juice in the meatloaf and the lemon slice that goes on top. It’s different than my meatloaf I’ve ever had. I’m not sure if she got this one from her Mom, but I tell you, everything her Mom made was so delicious and so different from what I grew up eating. 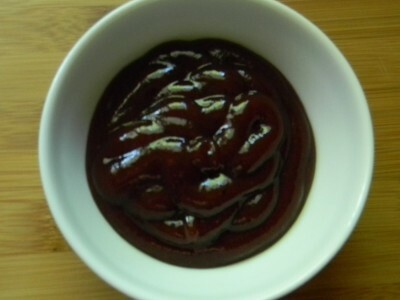 (and I LOVE my Mom’s cooking) One of the most interesting things she made was barbecued chicken with this sauce that consisted of equal parts yellow mustard, molasses and cider vinegar. Deeeeeeelish! She just kept basting the chicken with this interesting sauce. She also cooked over charcoal, need I say more? The greatest thing about cooking is you can take bits and pieces from different recipes and put them together to your own taste. I encourage you to do this with my recipes as well. Make little notes on your recipes so you can duplicate the next time. Take little risks in the kitchen. Sometimes it’s great, sometimes not so. 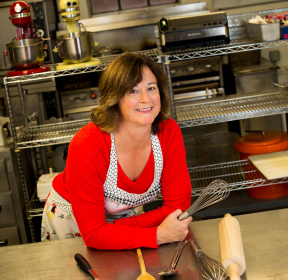 This is how you develop your very own unique recipes and kitchen skills. 1) Preheat the oven to 350′. Foil line a cookie sheet and coat well with cooking spray, or use non stick foil. 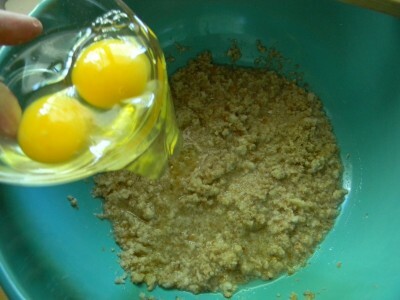 2) Place the bread in a large mixing bowl and add the lemon juice, onion and egg. Squish together well with very clean hands. 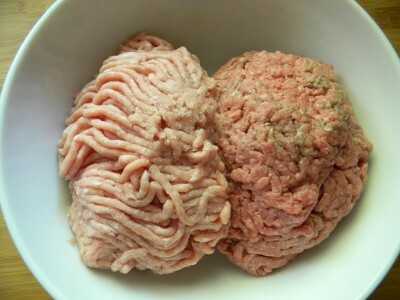 Add the meats and mix well with your hands. Shape into 6 oblong loaves and place on cookie sheet. Place in the oven and set the timer for 15 minutes. 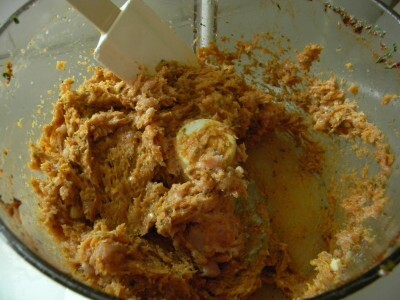 3) Mix all sauce ingredients together until well blended and divide in half. After the loaves have baked for 15 minutes, top with half of the sauce and 1 slice of lemon. Bake an additional 40 minutes. Serve with the extra sauce. Serves 6. Serve with a simple baked potato and steamed broccoli or green beans. Bolognese sauce is one of my absolute favorite sauces for spaghetti and there is something elegant how it rolls off the tongue, isn’t there? This takes a bit more cooking time than most of my sauces. Don’t be turned off by the fact that there are chicken livers in the sauce. They add a deep and rich flavor and they will literally disintigrate while cooking. 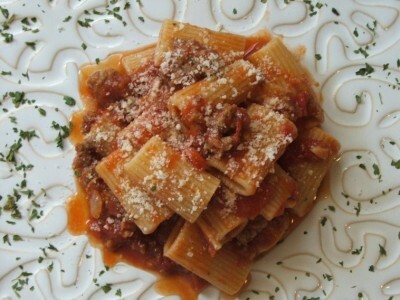 I would recommend doubling or tripling the recipe and freezing the extra sauce to enjoy later. I used my food processor to finely chop the ham and the vegetables that go into the recipe. I love the texture of the ground meat and the richness of the sauce. I subbed out turkey ham for the ham. Either way, you get amazing flavor from the smoked meat. 1) Coarsely chop the chicken livers. Melt the butter in a large sauce pan over medium heat. Cook the chicken livers for about 5 minutes or until they’re done. 2) Add the olive oil, ham, onion, carrots and celery. Cook for about 10 minutes. Add the garlic, cook for one minute. 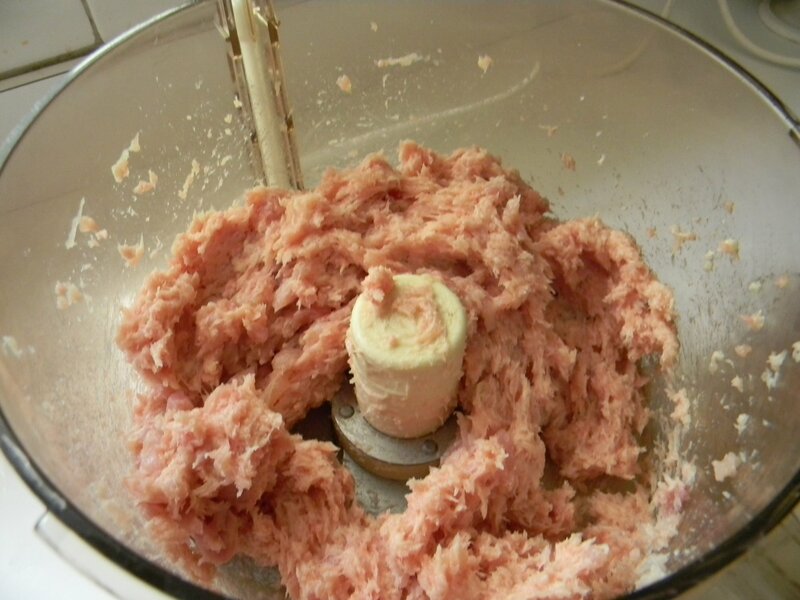 3) Add the ground beef and cook through breaking up large clumps of meat with your mixing spoon. Add the tomato paste and cook for about 5 minutes, stirring often. 4) Add the wine and beef stock. Reduce the heat to low and partially cover with the pot lid. Simmer for 2 1/2-3 hours, stirring every 15-20 minutes. Add a little more stock or water if the sauce is too thick. 5) Add the heavy cream and nutmeg. Stir well and give it a taste. Add salt and pepper to your taste. Serves 6. 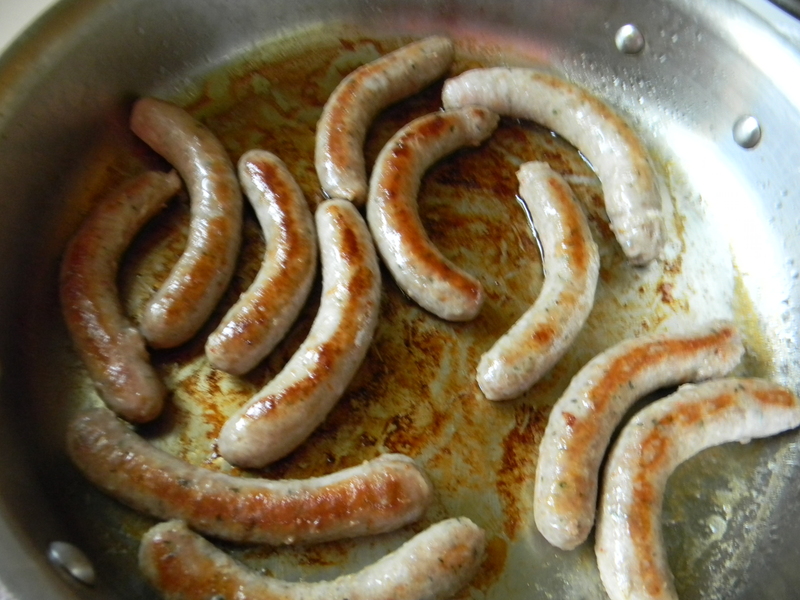 Sausage is one of my favorite meat varieties. I seldom buy commercially prepared pork sausage because of the high fat content. I tried Whole Food’s Italian Chicken Sausage, it was FANTASTIC! Very good, but very pricey. One sausage came out to about $3.00. So if I were to buy the usual 2-3 per person for my guys… you get the picture! It was then that I decided to get into my kitchen and come up with my own version. I must admit, I do not want to deal with the casings, so I make it in bulk and use it in soups, sauces, and pastas. 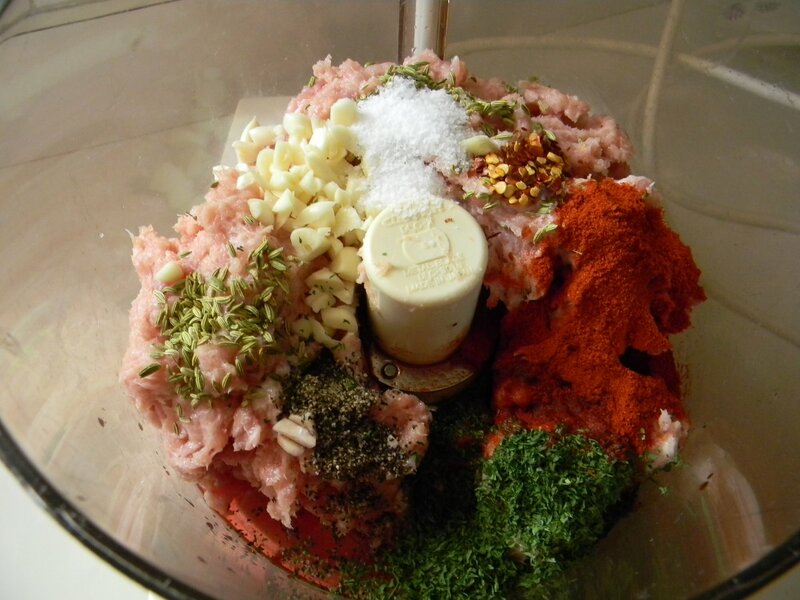 I have a meat grinder, but I find that using the food processor works nicely too. Whole Food’s sausages were very juicy, reminisent of pork sausage. I decided the best cut of chicken would be chicken thighs. You can kick up the spice simply by adding more red pepper flakes. Before you pull the meat out of the refrigerator, toast the fennel seeds in a skillet over medium-low heat for about 5 minutes, shaking the pan often to prevent burning. Coarsley chop the garlic. Trim the skinless chicken thighs of excess fat and put it into the food processor. Process until it resembles coarsely ground meat. Add the rest of the seasonings to the processed chicken. 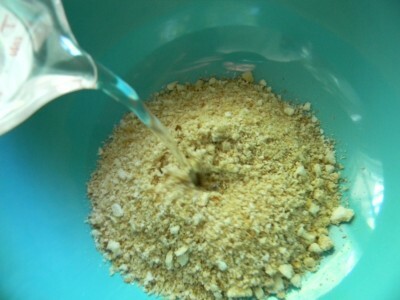 Process until all ingredients are well blended. Allow the sausage to meld in the refrigerator for 12-24 hours. Divide it up for freezing if you wish, date, and label. 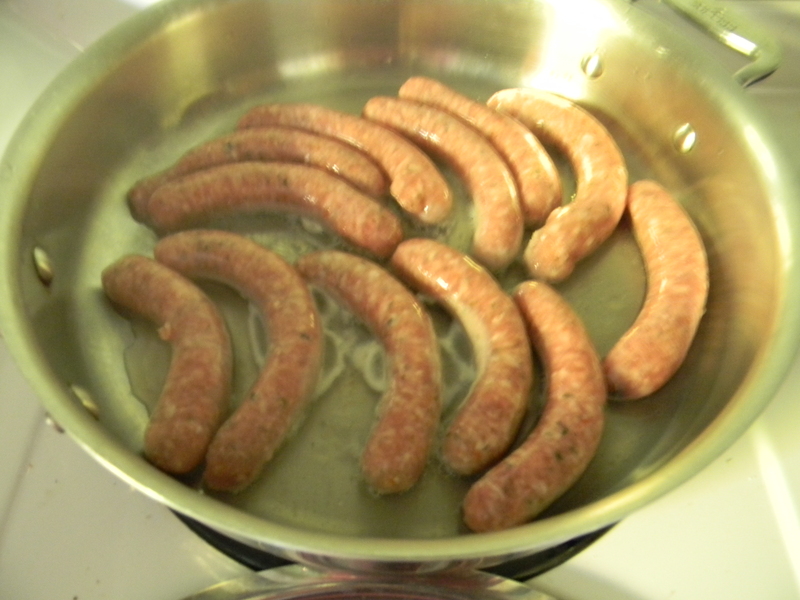 When cooking in a skillet, add oil to the pan as the sausage is very lean and will stick otherwise. Use in pastas, sauces, omeletts, or soups just to name a few. 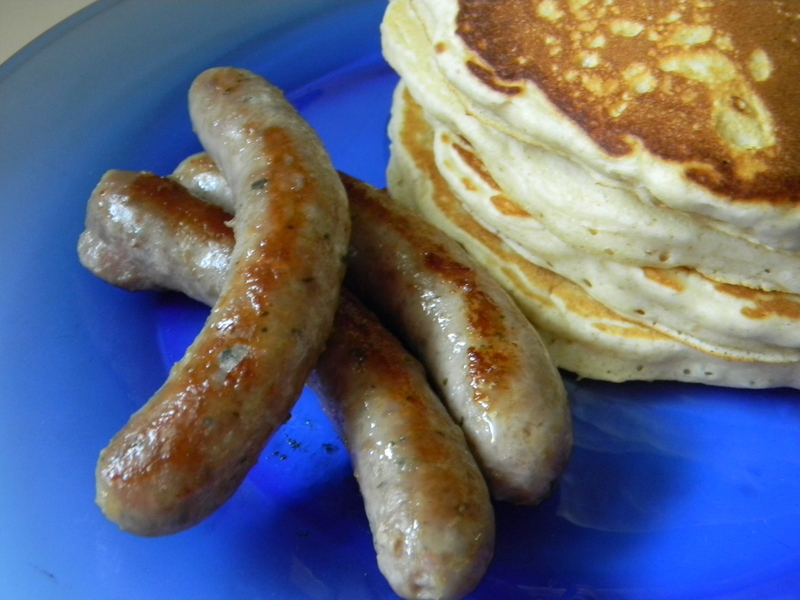 Stay tuned for a couple of savory and simple recipes using this flavorful Italian Chicken Sausage. One of my favorite events of this summer was reconnecting with my cousins at the Henderson family reunion. 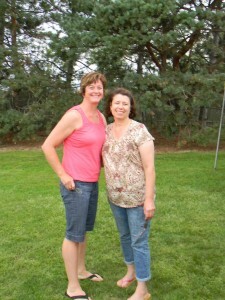 I’m pictured here with my cousin Diane. LOVE HER!! Anyway, we talked at length about the past and she brought up “The Green Bean Incident.” I am posting this link for Diane:-) I love our reunion picnics as everyone brings their best “go to” dish to share. The food was amazing! This got me thinking that since I haven’t posted recipes in awhile, I thought I might repost a few of my fav’s. Comfort foods come to mind when the days start getting shorter and it is getting pleasantly cooler. There is still plenty of time left for grilling. I do this so simply. I toss whole mushrooms and quartered onions into a bowl and drizzle with a small amount of olive oil. Season with salt and pepper. Skewer them each on their own skewers. (onions take much longer to grill, cook them first then the mushrooms) Personally, I do not think a good steak needs much more seasoning than good ole kosher salt and fresh ground pepper. Flank steak doesn’t need to be marinated to oblivion. Cooked to medium (a 1″ thick steak should be grilled about 6 minutes per side and turned only once) and thinly sliced on the diagonal is all you need for a flavorful and simple supper. If you’re ever in doubt as to whether your steak is done the way you want, use an instant read thermometer and follow the guidelines below. 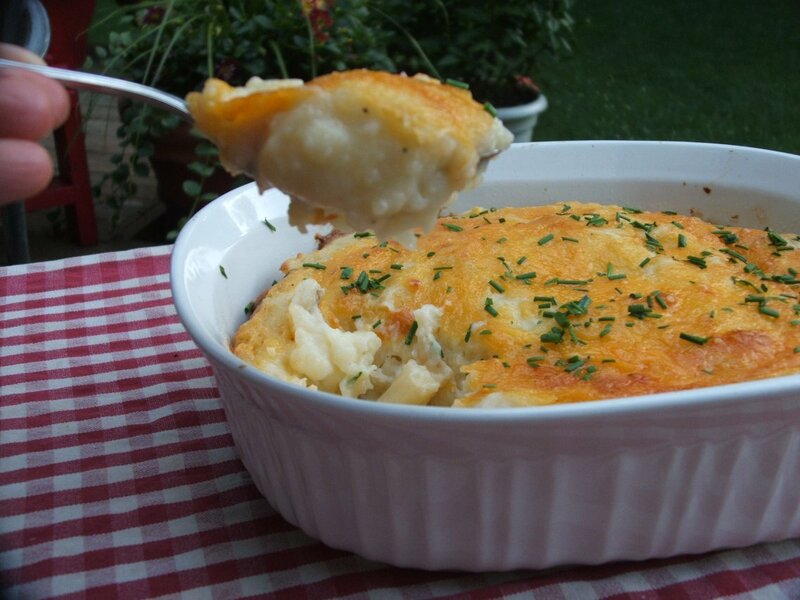 Twice Baked Potato Casserole. Perfectly sized or shaped potatoes are not needed for this recipe. I hope you had a restful weekend! 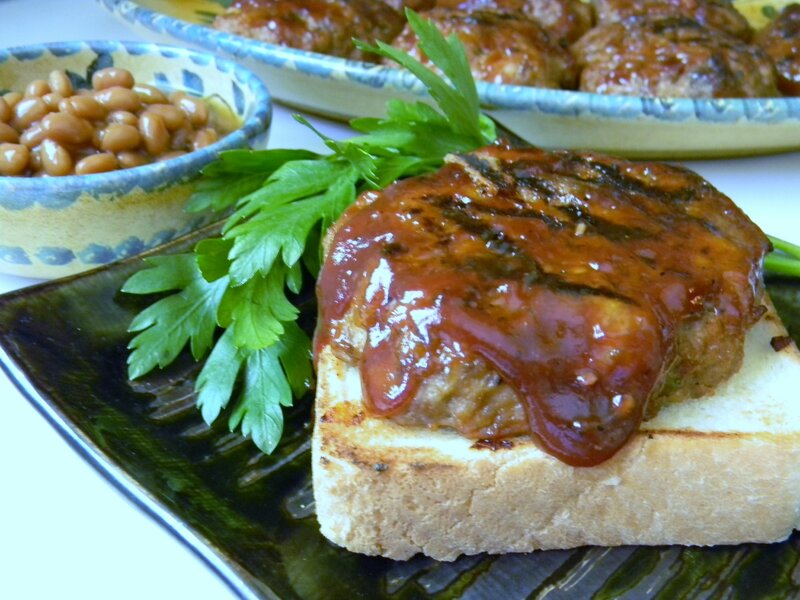 Barbecue Meatloaf Over Texas Toast with Bush’s Original Baked Beans….. These individual meatloaves are extremely tender and delicious. Serve over a piece of grilled Texas toast and perfectly seasoned Bush’s Original Baked Beans….this is the perfect summer supper! We begin with the basics, minced onions, celery, and carrots. This will add moisture and flavor. The ingredients in this recipe are very uncomplicated. We’ll need some olive oil, fresh minced garlic, salt, and pepper. Into a hot pan over medium heat add the olive oil, onions, celery, and carrots. Cook for about 9 minutes or until soft, stir often. Add the garlic and cook another minute or two. Remove from heat and cool. Preheat oven to 350′. We’ll need bread crumbs. I save the bread ends and put them in the food processor for a whirl. I use Sweet Baby Ray’s Barbecue sauce, but you can use your favorite. This will go into the meatloaf, you’ll need additional for basting while grilling. We’ll need 1 lb. 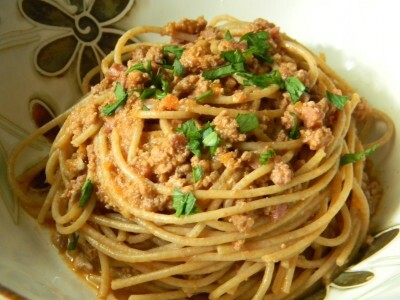 each lean ground beef and ground turkey. Into a large mixing bowl, add the bread crumbs…. Add water, this will add extra moisture as well. To the large mixing bowl, add the meats, the cooled vegetables, salt, pepper, and barbecue sauce. Mix well with clean hands and divide into 8 equal flat and oval shaped patties. Place on non stick foil lined cookie sheet or regular foil coated with cooking spray. They should look like this. 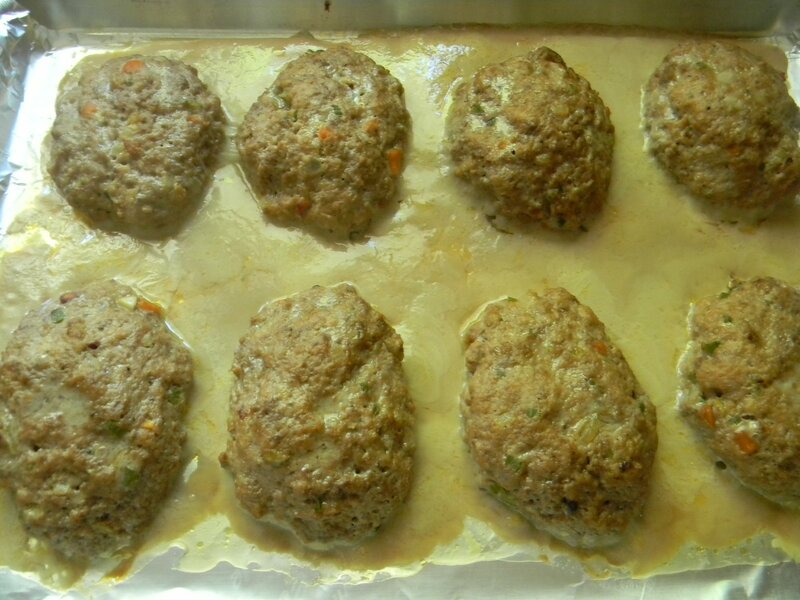 Cool for about 5 mintues and remove the loaves from the pan, removing any residual cooking residue. Oh, how rude of me. Allow me to introduce you to my new grill, Wendy Weber. Isn’t she beautiful???? Place the meatloaves on the grill over medium heat. After a couple of minutes, give a quarter turn. Give a turn after a couple of more minutes. Baste with barbecue sauce. 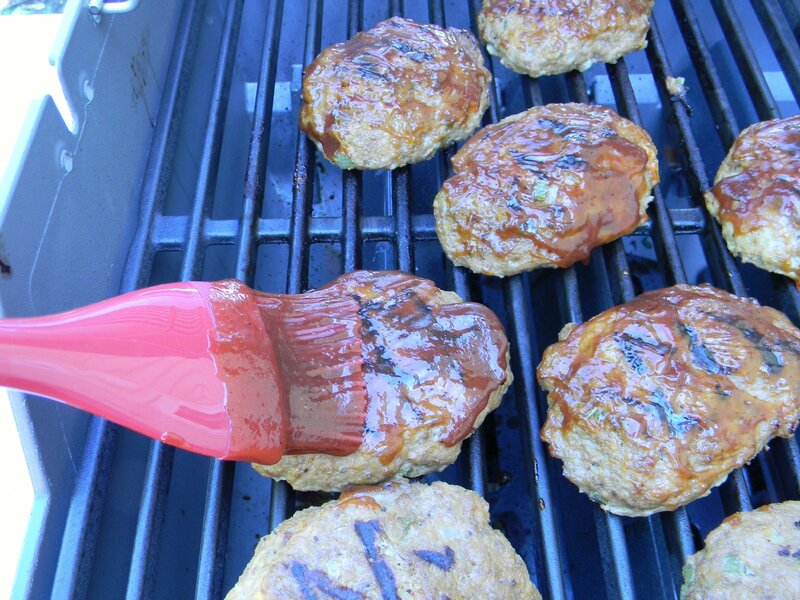 Watch carefully as the barbecue sauce can easily burn. Remove the meatloaves from the grill. Toast the thick and lightly buttered Texas Toast. 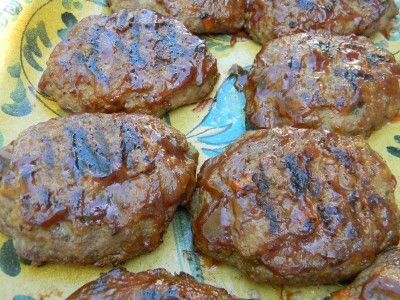 Serve the meatloaves on top of the toasted bread with extra barbecue sauce. 1) Heat a medium size skillet over medium heat until hot. 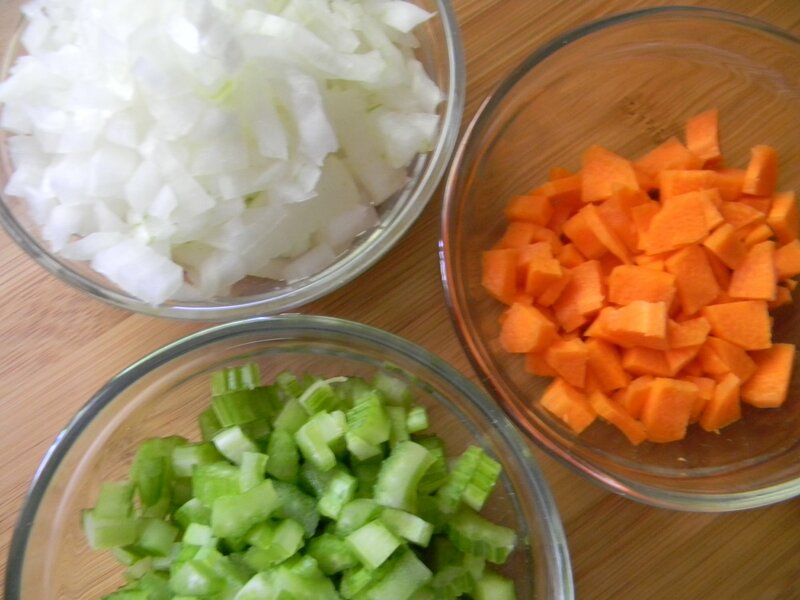 Add olive oil, onion, celery, and carrot. Cook until vegetables are tender, about 9 minutes. Add garlic, cook an additional minute. Remove from heat to cool. 2) Preheat oven to 350’. Non stick foil line a cookie sheet. 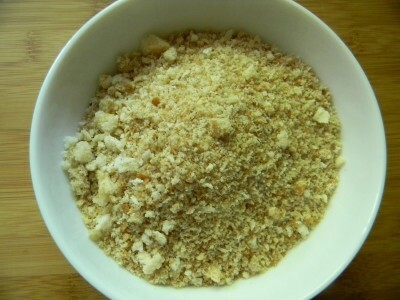 3) Add the bread crumbs to a large mixing bowl. Add water and eggs, mix well. Add the ground meats, salt and pepper, ½ cup barbecue sauce, and cooled onion mixture. Mix well with meticulously clean hands. 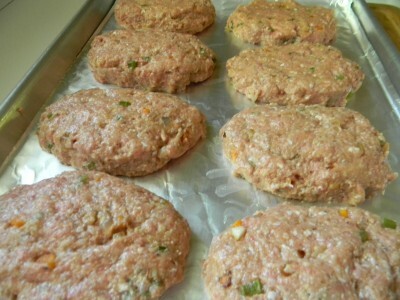 Shape into 8 flat, oval patties and place on prepared cookie sheet. (the meat will be extremely soft) Bake for 25 minutes. Remove from oven and cool for 5 minutes. 4) Preheat the grill. Place on the grill over medium heat for 4 minutes, give a quarter turn, cook another 4 minutes. Turn loaves and baste with barbecue sauce. After a couple of minutes, turn one last time and baste with barbecue sauce. 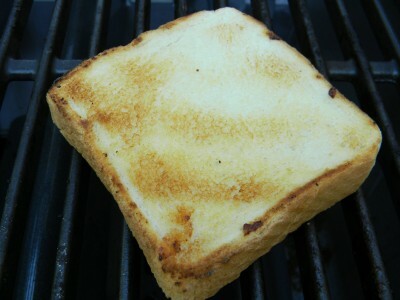 Grill the Texas toast for a couple of minutes per side until it is toasted. Serve meatloaf on top of grilled bread with extra barbecue sauce. Enjoy with Bush’s Original Baked Beans, DE-LISH!